Way Back Wednesday – Cuba Announces Support for the U.S.S.R.
Cuba Announces Support for the U.S.S.R. The Cuban Revolution which propelled Fidel Castro to power on January 1, 1959, initially attracted little attention in Moscow. Soviet planners, resigned to U.S. dominance over the Western hemisphere, were unprepared for the possibility of a future ally in the region. According to later testimonies from Nikita Khrushchev, neither the Soviet Communist Party Central Committee’s nor KGB intelligence had any idea who Castro was or what he was fighting for. Soviet premier Nikita Khrushchev advised them to consult Cuba’s Communists who reported that Castro was a representative of the “haute bourgeoisie” and working for the U.S. Central Intelligence Agency. In February 1960 Khrushchev sent his deputy Anastas Mikoyan to Cuba to discover what motivated Castro following Castro’s failed trip to Washington where he was refused a meeting with President Dwight D. Eisenhower. 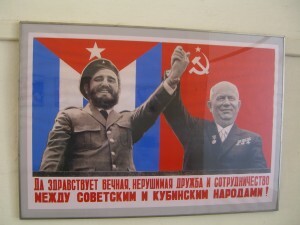 According to reports, Khrushchev’s aides had initially tried to characterize Castro as an untrustworthy American agent. Mikoyan returned from Cuba with the opinion that Castro’s new administration should be helped economically and politically. Though there was no talk yet of military assistance. Washington’s increasing economic embargo led Cuba to hurriedly seek new markets to avert economic disaster. Castro asked for help from the Soviets and in response Khrushchev approved the temporary purchase of Cuban sugar in exchange for Soviet fuel. This deal was to play a part in sustaining the Cuban economy for many years to come.